Councillor Sean O''Reilly during his mayoral term. 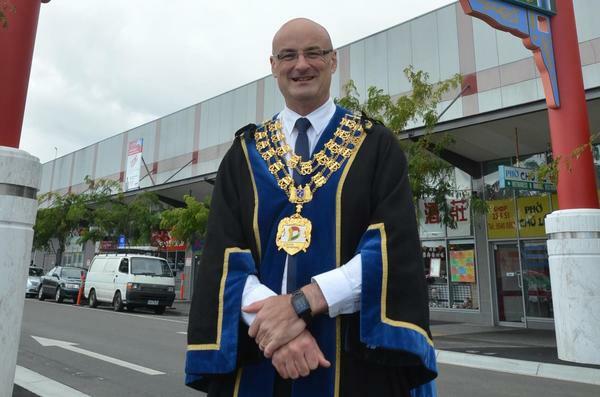 A GREATER Dandenong councillor appeared to take a swipe at his Casey counterparts at the 9 May meeting. Following unanimous support to allow more visitors at a Dandenong Islamic centre, Cr Sean O’Reilly emphasised that their decision was based purely on planning grounds. “Those are what should be taken into account,” he said. Cr O’Reilly’s comments followed Casey’s decision last month to refuse a permit for a proposed mosque in Narre Warren. The application before Greater Dandenong was from the Fiji Islamic Cultural Society of Victoria, based in Hutton Road. It received a planning permit in 2009 that restricted visitors to a maximum of 60 without applying to the council for a written exemption. The society asked for permission to increase patron numbers to 150 for eight religious events each year. Council officers recommended this should be restricted to five events and councillors approved this compromise. The council received three objections to the application, expressing concerns about there being “too many religious places nearby”, traffic, parking, crowds and noise. Cr Matthew Kirwan said he supported the increase because the applicant proposed using a shuttle bus from Dandenong railway station and the site was in a mixed-use zone.